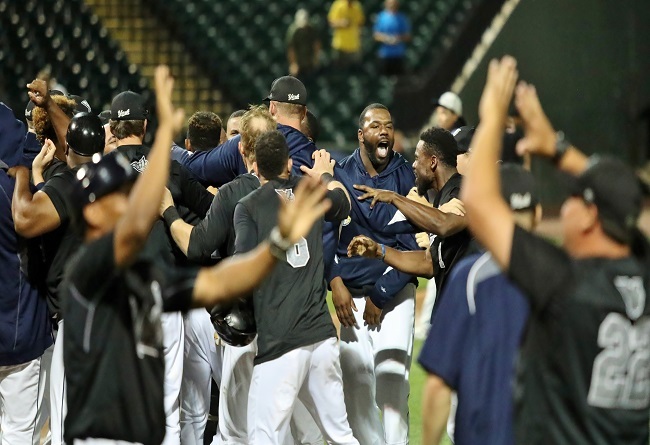 (York, Pa., Sept. 20, 2017) - With the score knotted at three in the bottom of the tenth, Telvin Nash launched a 3-1 pitch deep to left-center for a walk-off home run, giving the York Revolution a 5-3 win over the Southern Maryland Blue Crabs in Game One of the Freedom Division Championship Series on Wednesday night at PeoplesBank Park. The Revs host the Blue Crabs in Game Two on Thursday at 6:30 p.m. The Revs got out to an early lead in the first. Alonzo Harris opened the game with a single to left-center, and two batters later Rubi Silva crushed a triple to straight away center, scoring Harris from second to give York the 1-0 advantage. The Revs added to their lead in the second. Isaias Tejeda walked to lead off the inning, and Travis Witherspoon followed with a double down the left field line to put runners at second and third. Ryan Dent was hit by the next pitch from Crabs starter Gaby Hernandez to load the bases. After a strikeout, Harris, behind in the count, lifted a sac fly to center to plate Tejeda to make it 2-0 York. Jared Mitchell followed with a single through the right side to plate Witherspoon, putting the Revs up 3-0. Jay Gause gave York a strong start, giving up just two hits over six innings of work. The only run he allowed came on a solo home run to Michael Snyder in the fourth inning, cutting the Revs lead to 3-1. Snyder accounted for the only two Blue Crab hits against Gause who struck out six but did not factor into the decision. Joe Van Meter followed with a scoreless seventh inning, striking out two, but the Blue Crabs tied the game in the eighth. Ricardo Gomez set down the first two hitters of the eighth inning, but Jose Lozada cued a shattered-bat infield single past Gomez to keep the inning alive. Nate Samson followed by working a walk after laying off back-to-back close two-strike pitches. L.J. Hoes came through for Southern Maryland, lacing a two-run double to the gap in left-center field, tying the game at 3-3. Following an infield hit from Snyder, the Revs summoned Chase Huchingson who recorded the final out of the eighth and worked a 1-2-3 ninth. The York offense remained quiet from the second inning-on, as the game moved to extra innings. Grant Sides worked a scoreless tenth inning, retiring the Crabs in order and ultimately earning his first win as a Rev in the process. In the home tenth, Evan Reed got the first two outs quickly. Silva began the rally with two outs on an opposite field bullet off the scoreboard in left for his third hit of the contest. The next batter was Nash, who sent the Revs to victory and a 1-0 series lead with his walk-off blast to left-center. The Revs send Victor Mateo (6-9, 4.38) to the mound on Thursday night at 6:30 p.m., to face off with fellow righty Daryl Thompson (9-7, 3.87). For tickets visit yorkrevolution.com, the Apple Chevrolet Ticket Office, or call 717-801-HITS. Darrell Henry and Matt Present will be on the air at 6:10 p.m. on SportsRadio 1350 WOYK as well as online at woyk1350.com, the WOYK YouTube channel and on the WOYK App.